Enoc Perez, "Marina Towers, Chicago"
Enoc Perez, "Lever House, NY"
Enoc Perez, "Seagram Building, New York"
Enoc Perez, "Teatro Popular, Niteroi"
Born in San Juan in 1967, Enoc Perez first took painting lessons at the age of eight. As the son of an art critic, he spent family vacations traveling to museums in different countries and learning about the history of art. In 1986, Perez moved to New York to study painting at the Pratt Institute before earning his master's degree at Hunter College. Finding himself at odds with the program at Hunter, where students and faculty criticized his paintings as overly seductive and decorative, Perez maintained his belief in the importance of the aesthetics and pleasure in art. Embracing art's potential for pleasure and beauty, Perez paints sensuous nudes, still lifes, tropical resorts, and modern architectural icons in a sleek aesthetic with dazzling, vibrant colors. "In a way, these architects really believed in the idea of utopia. There's a true sense of believing in these buildings, and if you look at contemporary architecture, that's not as much the case. The fact that they're from a different era makes them nostalgic. 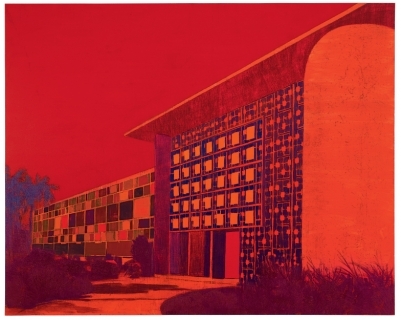 I love painting, and I believe in painting, and I share that with these architects who believed in utopia. A lot of painters paint to question the medium, which might be perfect for them, but I'm one of those who really believes in painting." Living in midtown Manhattan since 1997, Perez has been surrounded by the great skyscrapers and architecture of New York. Among other buildings, he has made series of the Seagram building, the Eero Saarinen TWA terminal, the United Nations building, and the Lever House. In 2007, he exhibited a series of Lever House paintings in the lobby of that very building. He is attracted not only to the optimism that went into constructing these skyscrapers but also to their now-lost sense of power and permanence, which has been compromised by the tragedies of 9/11 and the destruction of the World Trade Center. 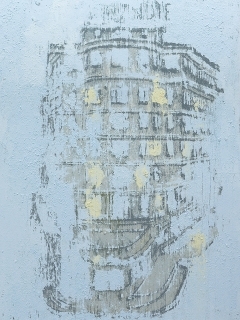 For twenty years, Perez worked in a technique related to the printmaking process. Inspired by the influence of Andy Warhol and his silkscreens on the New York art scene, Perez developed his own innovative method that mimicked the process of color printing. Working from both reproductions and his own photographs, Perez made separate preparatory drawings for each color he desired in his finished painting. He applied oil paint to the back of each these sheets and pressed them to the canvas to transfer the color. In 2010, Perez decided to begin working with brushes again. Describing his change in process, Perez explains: "For years I did not use brushes in the making of my paintings, the new paintings are done with brushes. I like the new work, making it has been renewing. Sometimes you have to burn your own house in order to create something new." Perez's work can be found in the following collections: The Metropolitan Museum of Art, New York; Whitney Museum of American Art, New York; British Museum, London; Museum of Contemporary Art, North Miami, Florida; Yale University Art Gallery, New Haven; New York Public Library; RISD Museum of Art; San Francisco Museum of Modern Art; Pennsylvania Academy of the Fine Arts; Corcoran Gallery of Art, Washington, DC; Museum of Contemporary Art, San Juan, Puerto Rico; Zimmerli Art Museum, Rutgers University; The Frances Lehman Loeb Art Center, Vassar College; Hammer Museum, University of California, Los Angeles; Williams College Museum of Art; Queens Museum; University Museum of Contemporary Art, University of Massachusetts, Amherst; University of California, Berkeley Art Museum and Pacific Film Archive; Picker Art Gallery, Colgate University; Art, Design, and Architecture Museum, University of California, Santa Barbara; Richmond Center for Visual Arts, Western Michigan University; Vera List Center, New School; and the Chazen Museum of Art, University of Wisconsin.